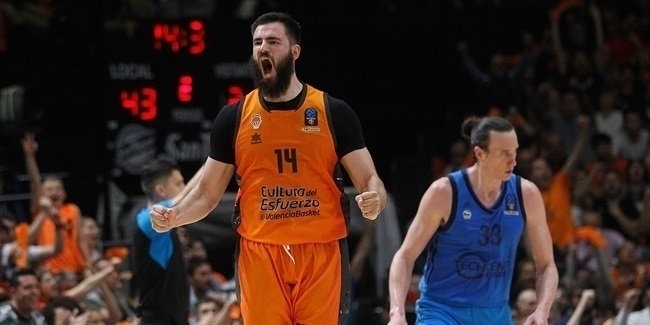 Valencia Basket’s remarkable 7DAYS EuroCup season continued on Tuesday with a 68-62 victory over Unicaja Malaga in Game 1 of the finals, during which All-EuroCup big man Bojan Dubljevic became the competition’s all-time scoring king! Dubljevic eclipsed the mark of 1,189 points, which teammate Rafa Martinez had held for all of two and a half quarters. Martinez made a long jumper off an inbounds play at the 6:16 mark of the second quarter to surpass Marko Popovic of Montakit Fuenlabrada for the career lead in EuroCup points; Popovic had set the record earlier this season. But Dubljevic nailed a three-pointer with 31.5 seconds left to seal the win and take his personal tally to 1,190 points. With at least one and perhaps two games left to this series, the top spot on the career scoring charts could still change hands between these two players multiple times. Dubljevic is completing his seventh consecutive EuroCup campaign, the last five of which came with Valencia. He was a key force on the club’s 2014 EuroCup-winning squad and owns more post-season awards than any player in competition history. Dubljevic was named the EuroCup Rising Star in both 2013 and 2014, earned All-EuroCup Second Team honors following the 2011-12 and 2013-14 seasons and was recently named to the All-EuroCup First Team for the first time. Dublejevic is also second in EuroCup history with 513 rebounds and third with 323 free throws made. Dubljevic began his professional career with Buducnost Podgorica in his native Montenegro, with whom he played his first two EuroCup campaigns before joining Valencia. Dubljevic also played one season at loan for Lovcen Cetinje. 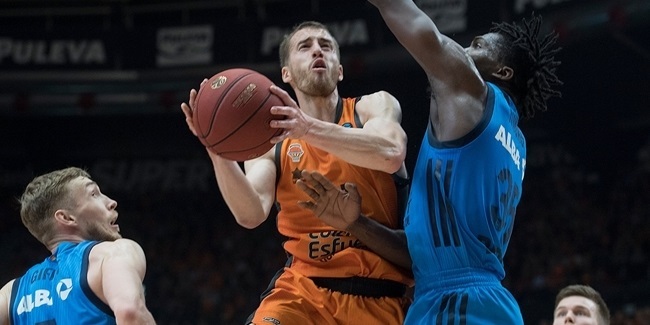 A two-time EuroCup champion, Martinez is in his ninth season with Valencia and has competed in the EuroCup in eight of them. He became the competition’s career leader in three-pointers made earlier this season and now has 214 triples in his career. Martinez is also ranked 12th with 259 assists and is 12th in career free throw accuracy (87.9%). He began his career with Basquet Manresa and played there through 2008 with the exception of time spent on loan at CB Vic and CB Valls Felix Hotel. 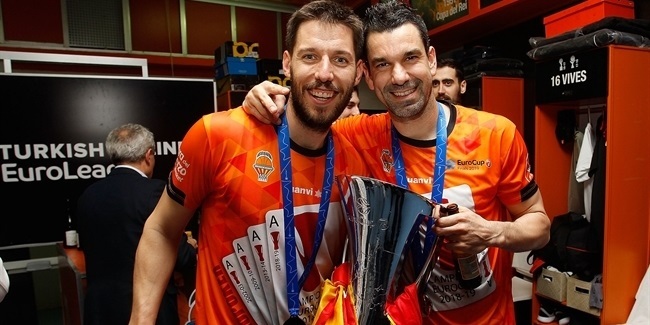 Martinez was a starter on the Valencia squads that won the EuroCup in 2010 and 2014.